Harvest Gold Memories: Space Food Sticks Still Available in 2012! 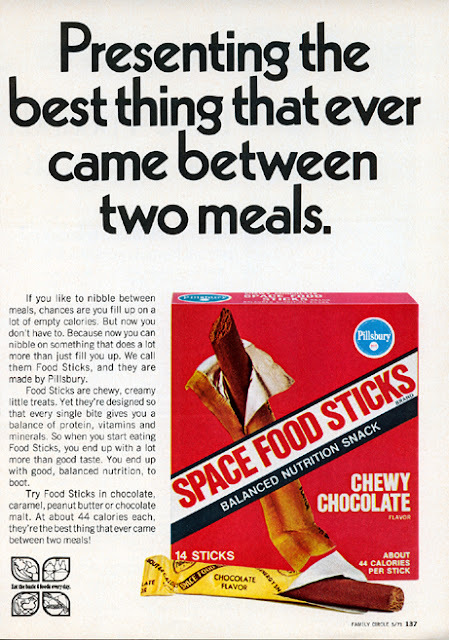 Space Food Sticks Still Available in 2012! Gen Xers didn't witness the moon landing or the associated space and NASA-related fads that emerged from that great American adventure. (In fact, our collective "space" memories may very well be the Space Shuttle Challenger Disaster which took place on January 28, 1986.) But that doesn't mean leftovers from the 1969 moon adventure didn't remain around for years after, one of which was known initially as Space Food Sticks. Pillsbury was the company who marketed the product, although Pillsbury itself became a division of bigger agri-business rival General Mills in 2001. According to the legend, in the formative years of space travel, food represented a major hurdle for NASA technicians. Keeping it fresh, tasty (or at least, edible, meaning it didn't test the astronauts' collective gag reflexes) as well as safe was tricky. The early astronauts were given sustinence in the form of cubes covered with edible gelatin or semi-liquid food puree squeezed out of a toothpaste-like tube. Apparently, Pillsbury lent its support to NASA, but saw an opportunity to catch a little "moon fever" for their company, leading to the creation of what were known, at least initially, as Space Food Sticks. A battery of food scientists at Pillsbury, lead by a guy known as Dr. Howard Bauman, whipped up an energy stick that was actually tasty (even if the nutritional value wasn't much better than a Snickers bar). They tasted like a cross between a tootsie roll, and Play-Doh. They didn't stick to your teeth the way candy did, and were promoted as nutritious, although an examination of the ingredients list today suggests otherwise. In any event, the long, chewy sticks could slide into an airtight port located in an astronaut's helmet to provide essential nutrition in case of an emergency. Needless to say, Pillsbury released a commercial spin-off of their cosmic creation, imaginatively dubbing the product Space Food Sticks. If the promoters are to be believed, in 1973, a version of Space Food Sticks made its way onto the Skylab 3 mission. Of course, by the time I sampled these pre-protein, pre-energy bars, the company had all but removed the term "Space" from the name, hence they were known simply as Pillsbury Food Sticks. To me, they tasted like a skinny cookie if memory serves me; they were sweet, but not monster-sized as candy and treats are today. Heck, a typical granola bar sold in 2012 is easily more than twice the size (and twice the calories)! At some point, though, the fad had run it's course, and according to the historians on this subject, after the energy crisis of the mid-1970s, the space program took a back seat to other pressing issues. 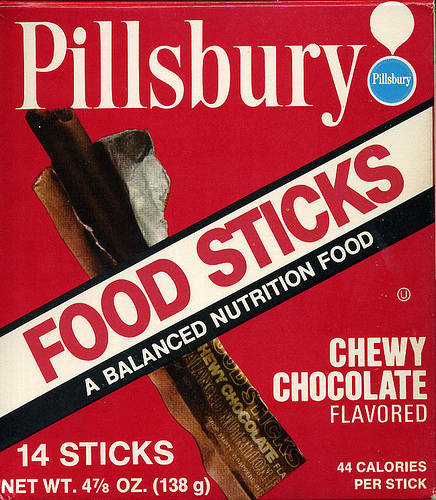 The product's profile was further reduced when Pillsbury dropped the "Space" from the name and distributed them as Food Sticks. The word energy bar hadn't been invented yet. Slowly but inevitably the fabled Sticks gradually disappeared from supermarket shelves. 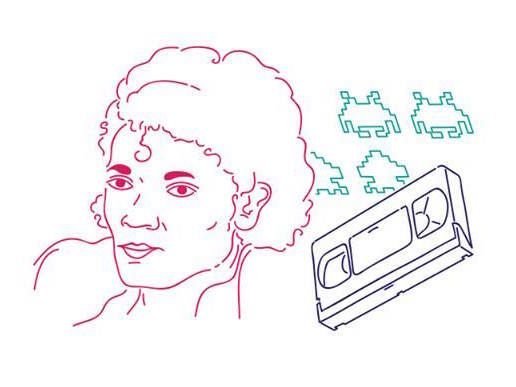 By the 1980s, they had become a memory. People still remember these things, and I'm pleased to share that a new form of these things is still available. In 2001, a company effectively resurrected Space Food Sticks. For example, you can find them at the Kennedy Space Center in Florida, as well as retailers like New York's famed toy retailer FAO Schwartz (as I understand it, FAO Schwartz has been owned by Toys R Us for over a decade, even though it's been something that was never promoted as New Yorkers like to believe their institutions are safe from the Wall Street greed mongers that work downtown, but I digress ...). The flavor of the resurrected sticks tastes the same as I recall them, although the shape is a bit more bar-like, not the skinny, rounded sticks I was used to -- I simply sliced them to make them more like the shape I remembered. What's even better is today, you can order these pieces of food history online. "We hired internationally-renowned food scientist Mario Medri to re-engineer the formula based on original ingredients and existing samples. Without Mario's random act of kindness (he didn't know us but he could tell we had passion) Space Food Sticks would be a distant memory. Mario introduced us to Kalman Vadasz, the "Michelangelo" of the confectionary business for over 40 years, to recreate the taste and texture of the originals. The results exceeded our wildest expectations. We hope you agree." My memories may not be as vivid as others, but I think they taste pretty darn close. Author P.S., December 7, 2014: This was posted on their Facebook page today: "We lost our manufacturer (insert sad emoticon here) so Space Food Sticks are officially out-of-circulation BUT we hope to re-launch the Sticks in a better-than-ever formula in 2015. We're looking at some new manufacturers but if you know anybody who can help let us know!" The reason seems to be they "got washed out by a private equity group" according to an article published by Vice (see http://bit.ly/2dY2T14 for more). Author P.S., November 27, 2017: Today, on Facebook, they wrote: "Three years after losing our manufacturer we found a new amazing recipe to make new Space Food Sticks in three flavors: Triple Chocolate Brownie, Chocolate Chip Cookie and Peanut Butter. They seriously taste out of this world! And the new packaging is very cool–a fun, modern take on the classic astro-snack you know and love. We plan to have these babies back in very early January ." As of early 2018, a product called Space Food Sticks had changed, and the original flavors are no longer being sold. For details, see their website at https://www.funkyfoodshop.com/space-food-sticks-chocolate-chip-cookie-p-157.html for more information. I lived on these things from 1976 until mid 1983 or so, (I know I was in college from 80-84)and they got me through many a long class. The original sticks were delicious. I ordered some a few years ago from an online company and they were much drier than the original. Maybe you've found better versions but nothing beats the original ones from the 70s-80s. I agree with the other poster from October 2012. I also lived on them as a kid. And I found a company based in Australia willing to ship a box of caramel flavored ones to me in the States. They were *almost* the same, but again, drier and a little harder than the original. If anyone finds a place selling caramels, let me know! These Space food sticks ARE the best Pillsbury product ever made ! those " sticks ! " I used to love these so much as a child. I really miss them. Born in 63' i was a fan of these food sticks during the 70s. later on around the mid-80s i found the real thing in a small neighborhood store. After the market closed a few years later, i was outta' luck. untill now! thanx a million 4 posting/sharing this info, now i have a new quest!! I still have a full box from 1968! Think they're still good?! Is anyone making these anymore? Would love to get ahold of some. I too lived on them as a child.